Roaming allows you to use your ookyo service while travelling overseas. What should I do when I'm overseas? a roaming Internet pass. Dial *100# when you're abroad to buy and track your roaming internet pass. What services work when I'm roaming? Note: Your Unlimited Apps and normal Internet passes cannot be used overseas. Roaming rates for calls, SMS, and Roaming internet passes depend on the country you are in. To find out more click here and remember to select Hotlink. How do I buy and track my roaming internet passes? How to share my roaming internet pass with friends? 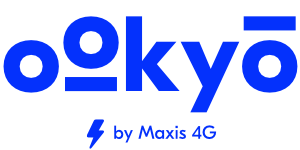 TIP: When you are back in Malaysia, please turn on ookyo VPN to enjoy Unlimited Internet!